Sharyn O’Leary pins a flower on her husband’s lapel as Tom O’Leary is named Business Person of the Year. 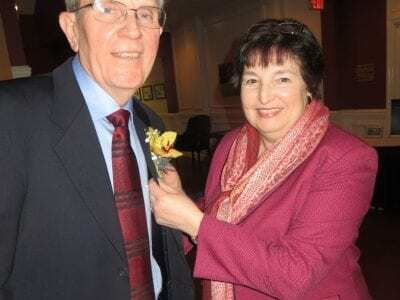 Inclement weather failed to dampen the spirits of some 200 entrepreneurs last Tuesday evening when the Greater Mahopac-Carmel C… Please login below or purchase a subscription to the Putnam County Courier to access this content. A Mahopac Falls couple facing felony charges last year for allegedly bringing their two infants, aged three weeks and two years, to a drug deal in Mahopac that was set up as undercover sting by the Countywide Narcotics Task Force, now faces addition… Please login below or purchase a subscription to the Putnam County Courier to access this content. Radon, a colorless, odorless gas, is the leading cause of lung cancer across the U.S. among non-smokers and for those who do smoke, it greatly magnifies the cancer risk. 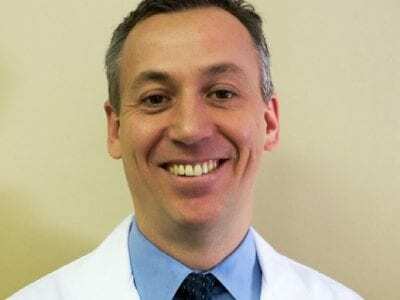 Putnam Acting Commissioner of Health Dr. Michael Nesheiwat reminded the public … Please login below or purchase a subscription to the Putnam County Courier to access this content. 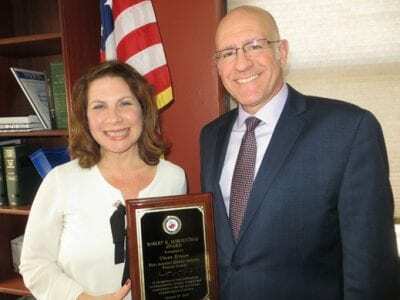 Assistant District Attorney Chana Krauss and Putnam District Attorney Robert Tendy display Krauss’ Award. Chana Krauss describes her recognition with the prestigious Robert Morganthau Award as the “defining moment of my life.” Kraus… Please login below or purchase a subscription to the Putnam County Courier to access this content. Above is Mingus the Labrador retreiver and to the right is Chibs, a Cairn Terrier. 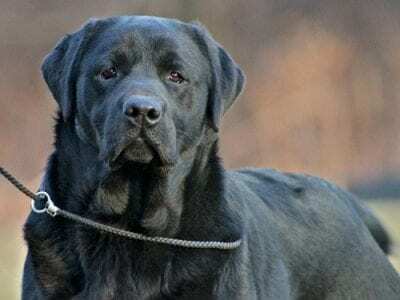 The Westminster Kennel Club Dog Show is the Super Bowl of its sport, and on Tuesday, two dog-brothers from Brewster will have the spotlight in the world-famous ring. A… Please login below or purchase a subscription to the Putnam County Courier to access this content. Officers of the Mahopac FD are recognized at the department’s annual installation dinner in Mahopac. 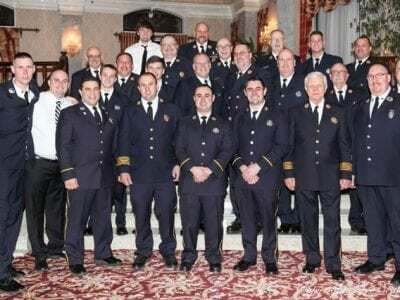 Newly elected officers for the Mahopac Fire Department took their oaths of office Saturday evening at the department’s annual installatio… Please login below or purchase a subscription to the Putnam County Courier to access this content. Dear Editor, I applaud the revitalizing of the old Town Hall, serving our community as a center for cultural events. However, after reading your article of January 11, “Village is one step closer to a Better Brewster,” I checked out the… Please login below or purchase a subscription to the Putnam County Courier to access this content. Lincoln’s Birthday, February 12 In June 28, 1862, as the Army of the Potomac was stalled outside of Richmond, President Lincoln wrote Secretary of State William H. Seward: “I expect to maintain this contest until successful, or till I die, or am co… Please login below or purchase a subscription to the Putnam County Courier to access this content.